I switch from sme server to ubuntu server. I've made a try with GIT, but due to a poor eclipse plugin which development seems to have stalled. I've chosen to try Bazaar. I've also mainly choose Bazaar because I already know cvs quite well, and made some try on SVN, but didn't know Bazaar at all (And I'm curious). I really like to thanks the people on the Bazaar mailing list for their help. I've started to install the eclipse plugin to see if ssh connection was possible. I've installed it by following the install instruction. Run the installer, choose the install path. Next I downloaded the bzr-XMLOutput windows plugin installer and make a md5 sum check. Run the installer, use the default directory. Click Ok, expand the newly added site, tick the "Eclipse plugin for Bazaar" and click the Install button in the upper right corner. Once installed, I've setup the server side on my new ubuntu server for the CVS to Bazaar conversion. In order to have a fairly recent release of Bazaar on ubuntu you have to modify the apt sources list, or you'll only get the 1.3.0 version of Bazaar whereas the 1.8.0 is about to be released. Now, here is the conversion part. As I'm a soooooo lucky man, I had a filename encoding issue : a few file filename happen to be encoded in a non UTF-8/non ASCII encoding and this was really a big problem to the conversion tools of bazaar. There's no mistake, it's "CVS2SVN" not "CVS2BZR" or something. simply press enter when asked for a password. Now your CVS Repository is here : ~/temp/cvsrepo and one of its subdirectory must be CVSROOT. Now we need to get some configuration file sample. I won't give away my configuration files because, the tool maintainer says on its site that this configuration file format often change. and change it to the relative path to your cvs repo. # (i.e., a module) within a larger CVS repository. # How to convert author names, log messages, and filenames to unicode. # the encoder always succeeds, but it can cause information loss. drwxr-xr-x  2 thomas thomas      4096 2008-10-07 17:48 .
drwxr-xr-x 11 thomas thomas      4096 2008-10-13 13:40 ..
That's what GIT and Bazaar conversion tools understand. After this command has been executed, your directory should have been filled with your files. And the revisions of these files in .bzr directory. It should convert your entire repository (~/temp/cvsrepo) into ~/temp/bazaar directory. If you want to convert only one module, use your module name instead of '.' in the command. The last tool I tried to convert my CVS repo to Bazaar is Tailor. It's this tools that succeed in converting my repository that have filename encoding. Instead of crashing on files that have issue (only 2 for what I know), Tailor trap the exception and continue the conversion. The two files I lost was doc files with nothing really important. Thanks to Colin D Bennett (who apparently works on Grub) who gave me it's configuration files for Tailor I did try tailor and succeed. (I was about to give up the history of my project and import as a new project). Tailor connect to your CVS repository and do not need to have a direct access to the repository files. On my linux box, I use CVS through SSH, I'm not using a pserver. The first [crf] is a name you pick. Next, source & target will be the name between bracket. In the source section, you put your cvs configuration. the target section doesn't need more instruction (bzr: seems to be enough). I advise you to use a public key ssh authentication as it will ask you for the password several times. Repeat for each module of your repository. Before Bazaar, I've set up on my own server a CVS server, JIRA/Confluence/Fisheye for the project handling. As I've made no release yet (it's should happen soon), JIRA/Confluence was not really used. Now I've migrate to Bazaar, I could set up a Bazaar server. But I did loose a huge amount of time on the Bazaar conversion (because of this ***king filename encoding issue) and I found it would be more efficient and more reliable to use Launchpad.net plateform. So, I've created my project (http://launchpad.net/crf-irp), update my profile with my public key, load my private key into pagent. It took some times as my repo was about 300MB. Next Blog post : How to import a project with the eclipse plugin. While I was on sick list, this last two week, I've search to get away from the venerable CVS and it's painful merge capabilities. (Also I was curious to try something else). But it's not working well enough to be used. Also its development seems to have stalled. That's why I tried Bazaar... but that's for another post. My main computer has a major hardware issue (probably the motherboard, maybe the cpu). I can't re-install windows, it crashes in the middle of the installation. To complicate things, I've installed my windows on a (fake)hardware RAID0. It's fake because the raid part is handle by the windows driver. That's why you can still see the hard drives under linux as /dev/sda /dev/sdb etc... even after having setup your RAID0/1/5 Array in the bios. But still, I wanted to check that fact (I'm not dumb ;) and get some non critical files, such as game save (I don't play that much recently... so sad, but it may change once Diablo III or Starcraft II is released). To get my data back, I've used a linux Distribution and use it's DMRAID capabilities. I've downloaded and burned the Gentoo Live CD. BTW, it's a really great distribution. I loved to installed it from scratch and compile all from sources. alias ll="ls -la"                         #this one should be always set by default ! drwxr-xr-x  2 root root    180 Oct 13 00:18 .
drwxr-xr-x 17 root root   4320 Oct 13 00:18 ..
Next : create a simple directory within the root (remember it's a livecd, it's in memory modification). I needed the shortest path possible to not loose time typing long path as my system was really not stable. Next : find the name of the device representing the Fake RAID. For me, it was nvidia_*. nvidia_dacaiefa is the (virtual raid0) hard drive, and nvidia_dacaiefa1 it's first and only NTFS partition. Next : Mount the ntfs partition in the filesystem. to get my data out of this sick computer ! I'm installing several ubuntu servers for various purpose (home server, Secondary DNS server, new primary DNS server, web servers, development servers). For each one, I write the setup documentation (which are stored on a google apps premium account, which is by the way a must have for all the cooperative stuff). #exec /sbin/shutdown -r now "Control-Alt-Delete pressed"
Change to 52 weeks of log retention as it's the new law in France. and then shutdown the server. 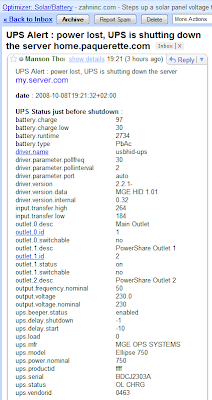 The UPS state is useful as it shows you the health of your UPS when it goes on battery. If the charge is really low when the server is shutdown, you might want to reduce the time it wait on battery before shutting down the server or replace the battery (or the UPS). If the charge is really close to 100, you might want to increase the time on battery. Script to send mail are located in my home account /home/thomas. 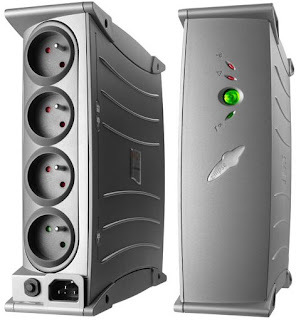 My UPS is a MGE Ellipse 750VA connected trough USB. NUT is the piece of software that will communicate with the UPS, and shut your server down properly. I've read that MGE is involved in NUT development, which is worth to be mentioned as it's not so often a company do that. NUT documentation is for nuts ;) (easy joke) Well not that easy to get into. In all configuration files/script excerpt, I'll use some colours to show the link between configuration files. So if you want to change one value to match your config, change all string with the same colour. change the first two 'no' to 'yes' to do so. desc = "MGE UPS Systems UPS"
Within the bracket, you can set your UPS name (no space allowed). The most important thing is to find your driver that handle your UPS. For an USB connection, the port is 'auto'. and put /dev/ttyS0 instead of auto. This file defines who is able to connect. In my case, only localhost. I guess this files is involved when you have several computer connected to one big UPS. This files basically tells NUT what to do on power outage. The first instruction defines on which UPS is monitored, on which machine, the user/password used to connect, and the type : this is the master server. All the line is defined from the previous configuration files we created, so if you change them, change this line too. The SHUTDOWNCMD is what will be executed to shutdown the server. NOTIFYCMD is called when the power status change (OB : on battery, OL : on line). On ONBATT event, start a time called onbatt for 30 secs, when those 30 secs are ellapsed the CMDSCRIPT will be called, unless a ONLINE event is recieved. At first I create a dedicated directory in /var/run named upsshed, but upon server restart, the directory is deleted... so instead I used the existing /var/run/nut directory. that will display what is appended to the daemon.log file. It's usefull to understand what's going wrong. This should stop the computer. Now, about the /home/thomas/scripts/alertAndShutdown.php script. This would create a scripts dir in your home directory. First : I use php as my linux script engine because it's simple but yet powerful, and I know this language very well and it's already installed for other need on my linux box. Before we proceed we need to add a group. As I run several scripts with several user (root/thomas/nut etc...), in which there is some private data such as password (linux account/MySQL etc...) we need to do something so that all user that run these scripts can read these files, and only them. To do so, we'll create a group, and add all those user to this group, and change the file permission so that the file belong to this group. #thomas is a sudoers so you need to add admin otherwise you won't be able to sudo again. my mail function is based on the gmail example within the phpMail archive. And the last command which is utterly needed otherwise your server won't stop : "/sbin/upsmon -c fsd" which will tel NUT to run the shutdown cmd. While you do so, use a console with the "tail -f /var/log/daemon.log" running in it. Unplug the UPS, wait to see in logs that this as been seen by NUT, replug the UPS, and see that the timer is canceled, your server shouldn't stop. Unplug the UPS, wait more than 30 seconds (the time we set in upsshed.conf), see that you recieved a mail and that our computer shut down. Uncomment the last line of alertAndShutdown.php, re run test 3. My UPS with my server last 14 minutes with an initial battery state at 92% of full charge before reaching the 30% low limit (on which NUT execute the SHUTDOWNCMD anyway). My server parts are designed to be low power consumer, so the result is not that nice. recheck your UPS from time to time, like every 6 months. UPS lifetime can be bad.